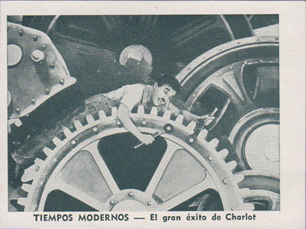 Notes: This set shows 40 scenes from the Charley Chaplin film "Modern Times." That film was released in 1936, so this set was probably issued around that time. All the cards show the same title, so there is no checklist for this set, the checklist goes by the card numbers. All the cards in the set are pictured when you click the card link on this page.